Thousands of people reach adulthood without having alignment issues addressed when they were young. Many of them look into options available for adults to straighten teeth. If you are one of those people, Dr. David Spilkia of David Spilkia Family and Cosmetic Dentistry, located in Philadelphia PA, wants you to know about our Invisalign braces for adults. We want all our patients to love their smile! Invisalign is a clear aligner system designed with adults in mind. 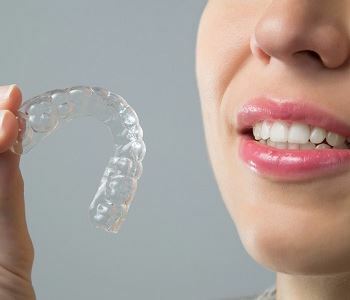 It straightens your teeth using smooth, BPA free plastic aligners created from molds and x-rays of your mouth. The plastic is virtually invisible and fits directly over your teeth. They gently shift your teeth into the correct position and have very little impact on your daily life. Almost invisible: No food will get caught in your Invisalign aligner, like in traditional braces. The clear plastic makes it very hard to notice that you even have braces! Practical: You can remove your aligner. In fact, we recommend you do for your oral hygiene routine and to eat. As long as you are wearing your aligners for 22 hours a day, they will work. Comfortable: There is no chance of the aligner trays rubbing your cheeks, tongue, and gums raw as metal braces do. Fast: Metal braces, especially for adults can take quite a long time to get your teeth into alignment. Invisalign works in as little as a year and usually only takes a year and a half maximum to achieve results. Invisalign works best on mild to moderate alignment issues. It’s also not used for children, as the trays could easily become lost or destroyed. We will help determine if you are an ideal candidate for Invisalign. We have other options available if it isn’t. Don’t live with crooked teeth any longer! Call us today to get started on that beautiful, straight smile. (267) 463-2777.